I’ve heard many times that the most exercise I’m going to get purchasing elliptical equipment is assembly. And since I’ve been through it, I can say that isn’t far from the truth. I am very comfortable assembling many different items. I’ve never had a problem with IKEA furniture (I survived college this way), I’ve assembled a Weber Grill, and have installed the baseboards in my house. That being said, it still took about 2 hours 30 minutes to assemble the Schwinn 430 Elliptical, by myself. And though most of the steps only require one person, there were a couple of steps that would have been more convenient with a second set of hands. The provided instructions were fairly easy to understand. With detailed diagrams to make understanding where which bolts should be attached, words are kept to a minimum. This in my opinion is a plus (words are easily misunderstood). If you’ve misplaced the instructions, download the Schwinn 430 Elliptical Manual. Overall, I rate the instructions a 9 out of 10 on overall usefulness. If you have successfully assembled any IKEA furniture, you will have no problems putting together this elliptical. 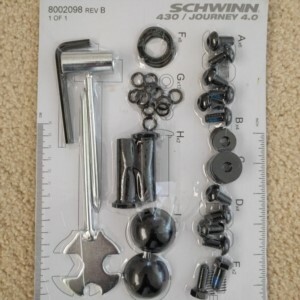 The small pieces (screws, nuts, washers, etc) are conveniently vacuum packed onto a small sheet of cardboard, and clearly labeled to simplify matching these physical pieces to pictures in the instructions. Additional pieces are also screwed directly into the larger parts, completely eliminating any piece mismatching. Simply unscrew the pieces, attach the additional larger piece, and re-screw the same small pieces. Since it does require unscrewing first, it does add work, but eliminates searching and matching a piece. The elliptical comes shipped with all the tools required for assembly, but it never hurts to have your own tools, which are always more convenient and user friendly. The most difficult part of the installing the elliptical was attaching the center console which contains all the electrical portions. Snap in part of the pieces too early, and it’s difficult to remove again with carefully adjusting twisting the parts. Part of what makes it so difficult is the cabling inside the machine isn’t very long, by design. But that ends up challenging attaching the pieces and the cables together simultaneously. After approximately 2 hours 30 minutes, the whole elliptical was finally complete, no extra pieces! This particular elliptical has a minor sway when using, but otherwise seems very well built. One difference compared to a real gym is our home elliptical equipment is placed inside a carpeted room, as opposed to hardwood. Now that the Schwinn 430 Elliptical is fully put together, let's see how many times per weeks we use it.